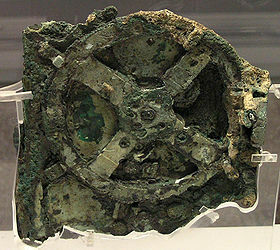 This machine – this lump of corroded metal – fascinated me when I read of it a decade back. Could it really have been made more than 2,100 years ago? There were tantalizing hints of a complex geared mechanism, but the corrosion made speculation about it little more than wild guesswork. For long after its discovery in 1901, it was thought to be a form of clock. Then, gamma and x-ray images of its interior were used to attempt a reconstruction, but it wasn’t until 1997, when X-ray tomography was used, that the full purpose of the device was shown to be to predict the movement of various astronomical bodies, as well as which of the games (like the ancient Olympics) were to take place in any given year and possibly even give the timing of eclipses. This is no less than the first known analogue computer. The tomography images meant that a working brass reconstruction could be attempted and this was eventually presented in the National Hellenic Research Foundation in Athens in 2007. There’s another article about it here. It’s not just the mechanism that tomography revealed. There were engravings visible on the original corroded artifact, but this advanced imaging revealed a lot more of the inscription, and this helped to confirm many of the details. A working virtual digital reconstruction of this device shows, layer by layer, how the mechanism was connected and what each gear train and dial did. But now, amazingly, a working device with the same functions – but not the same appearance – has been constructed in Lego! Ambling around The National Archeological Museum in Athens in July 2011, I stopped dead in my tracks as I came face-to-face with the Antikythera device. I had forgotten that this is where it was displayed, and this was a highlight of the year’s summer holiday.